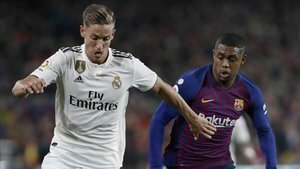 Marcos Llorente, Real Madrid's defensive midfielder, is out for a month after sustaining a thigh injury against Barcelona in the Copa del Rey on Wednesday. The Spaniard will miss the Madrid derby with Atletico on Saturday, the return of the Champions League and the Copa semi second leg. It was his first Clasico as a Madridista but in the second half he sustained the problem and Casemiro came on after having recovered from injury himself. Llorente took tests on Thursday and it confirmed a new grade II injury in his left thigh. Llorente hurt that muscle on December 31 and missed six matches, and now it has happened again.